The potter’s house is the place God has told you to go so He can cause you to hear and understand His word. Jeremiah 18:2 Arise, and go down to the potter’s house, and there I will cause thee to hear my words. The Lord wanted for Jeremiah to go down to the potter’s house to learn a valuable lesson. It was not until he got down to the place God appointed for him that he would hear the words of God. God often has a potter’s house in our lives. It could be a physical place He wants us to go. It could be a person He wants us to talk to. Regardless, until we take the step of faith and follow the leadership of the Holy Ghost like Jeremiah, we will not hear from God. The lesson that God had for Jeremiah down at the potter’s house was one of humility. The lump of clay had to humble itself under the hand of the master and let him mould it and shape it. 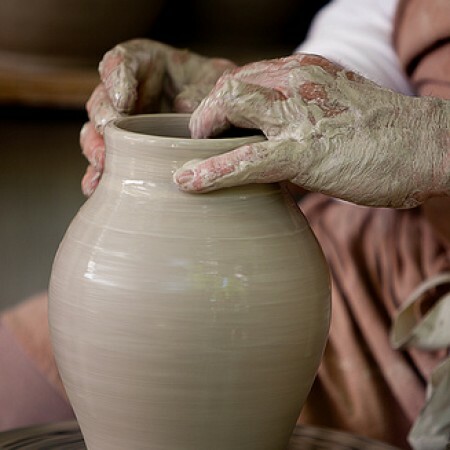 However, the potter did not just shape it, he started over a second time. He reshaped a lump of clay that had made a mess of itself. The clay was mared and had a defect. The reality was the potter probably should have just thrown the clay away and started over again. But he did not. With the skill of a master potter, he was able to make a vessel of honor. That is what God does with us. He takes a mared and broken life and by the blood of Christ is able to fix it. He washes the sinner clean. He makes a new life. He creates a new vessel, a new creature in Jesus Christ. However, if the clay is not at the potter’s house, it cannot be made in a vessel of honor. The clay needed to be where God appointed for it to be. Jeremiah needed to be at the potter’s house to learn and hear what God has for him. First and foremost, as Chrsitians we need to be in the house of God every time the doors are open so that God can cause us to hear His words. You need to be in your Bible everyday so you can hear His words. It is so important we be in our place to hear the words of God. Are you where you are supposed to be so you can hear from God today? Are you going to be a good Bible preaching, Bible believing church on Sunday so God can cause you to hear His words? It is important. It was important for Jeremiah to be in the potter’s house. You need to be in the potter’s house, the place God has for you, the place he has told you to go. This post has been seen 1376 times.